It’s hard to believe, but the 2018 Electronic Entertainment Expo is nearly upon us. As the worldwide Unreal Engine development community gets set to showcase its offerings on the gaming industry’s biggest stage June 12-14, we’re extremely excited to partner with NVIDIA and Intel on the Unreal E3 Awards 2018. Similar to years past, we’re partnering with NVIDIA to ensure that each winning team will receive an NVIDIA GeForce GTX 1080 Ti graphics card. 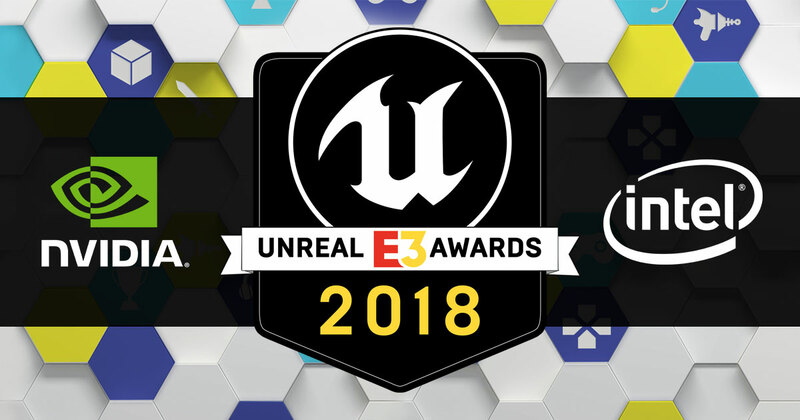 "Our partnership with Epic on the Unreal E3 Awards aims to recognize and reward developers from around the world with our very best hardware," said Fredrik Liljegren, Director, Systems Software, NVIDIA. "Whether it's through this initiative with Epic, our own Indie Spotlight program or the growing GeForce community, we're always excited to showcase Unreal Engine developers and their projects." In addition, we’ve joined forces with Intel to provide each category winner with a premium gaming processor, the Intel® Core™ i7-8700K Processor, brought to you by Intel’s Game Dev Program. From Biggest Buzz to Unreal Underdog, this year’s award categories aim to highlight a wide variety of teams doing amazing things at E3. After evaluating the UE-powered games at the show, we’ll be announcing the nominees on Thursday, June 14 and revealing the winners one week later on Thursday, June 21. This award is given to the most visually impressive Unreal Engine game at E3 2018 and rewards the use of leading-edge graphics that push the medium of interactive entertainment forward. This award is given to the experience that we simply can’t put down. Nominees will make players forget about their surroundings and be transported into a truly immersive experience. This award is given to the project with huge potential as an all-new IP. Nominees will spark interest not only through gameplay, but through original characters, worlds and the potential that is put on full display during E3 2018. This award is given to the project that creates the most talked about moment of E3 2018. From a major game reveal to an undeniably impressive demo or a major twist that flips the industry on its ear, this award goes to the Unreal Engine team or project that produces the most buzz. This award is given to the team that pushes the limits to achieve an amazing showing for their game or experience at E3. Focusing on not just the product, but the people and process behind it, this award acknowledges a team’s perseverance to make a big splash at the big show. UPDATE: The nominees have been announced! Find out who's in the running to be our Unreal E3 Award winners on the E3 event page. If your Unreal-powered project will be on display in or around the LA Convention Center during E3 2018, please put yourself on our radar by emailing e32018@unrealengine.com and letting us know about your presence at the show. Of course, we understand (and respect) the fact that some of you might be saving your surprises, so we will certainly keep all confidential details confidential. Be sure to check back during the week of E3 to hear about all of the nominees and see our Unreal Engine developer interviews straight from the showroom floor! We look forward to seeing you E3 2018!